Having made chicken schnitzel for the kids before, I knew they would love it enough to “gobble up the whole thing, salad included, in no time”. By the way, they asked me to write that so I am. Apparently this is their second or equal favourite meal to the fish en papillote. It seems even pasta and meatballs are suffering in the popularity stakes these days. It all makes me very happy, their excitement about raw veggies especially. The schnitzel coating is made from multigrain crumbs for added goodness of seeds. I actually use chicken thighs for the ‘nuggets’ as they are more succulent than breast meat and simply pull apart when cooked. The cucumber and cream slaw is a traditional Polish salad (called mizeria), though each nation in the region has its own variety; the Germans use vinegar instead and over to the East sugar is also added to the mix. I absolutely love it with schnitzel and mash. When I was a kid I would mix the salad and potatoes together, colcannon-style. Actually, I still do… Yum! I like to use organic or at least free range (Lilydale is my brand of choice) chicken because it’s raised more naturally, with non-GM modiefied feed, no antibiotics and able to roam free which results a much better tasting bird. In terms of breadcrumbs you can use plain, sourdough or panko varieties, but I like multigrain. Start with the slaw as the cucumber needs some time to ‘wilt’. Using a vegetable peeler slice cucumber into paper-thin slices. Add salt, mix and chill in the fridge for 20 minutes. In the meantime, prepare chicken thighs by cutting out any sinew and taking fatty bits off. Cut fillets in half. Whisk egg in a bowl. Dip chicken pieces into flour, coating thoroughly, then egg and breadcrumbs, set aside. Heat a little oil in a large frying pan, just enough to coat its surface, reduce heat to medium high. Brown chicken for 3-4 minutes on each side, cover and stand till ready to serve. Finish the salad by mixing in the dill and cream. Serve both with some rice or, my favourite, mash potatoes. Fantastic a quick, fresh kids meal that’s not from a packet. Thanks Mez! Packet or Maccas! 😀 it used to be my all time favourite as a kid… Yum! I recently discovered your website, and I love it! I’ve already bookmarked a few recipes to try. My family is from the former Yugoslavia and I grew up with a similar cucumber salad that uses sour cream instead of normal cream. Oh, and some garlic, too. Yum! Hi Erica, thank you for your kind comments, so glad you like my recipes. I like the sound of your version of the salad too – I adore garlic! Good work on cooking up delicious food for the kiddies and raising them up to appreciate good and healthy food (since kids can be picky)! It’s amazing too, watching their tastes develop with time. They ask for garden salad now, whereas they didn’t use to 12 months ago… It’s nice. 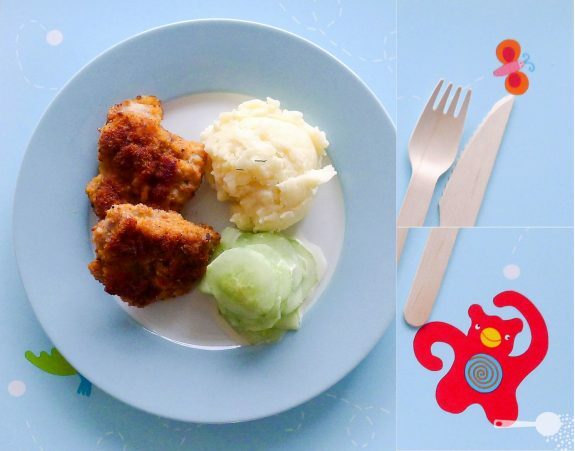 what a great way to make kids eat vege as well…. Lilydale is also our brand of choice . What a great recipe idea this is for the kids!